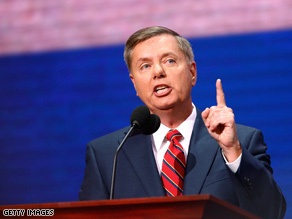 Lindsey Graham differs with his fellow South Carolina Republican Jim DeMint on how the GOP should move ahead. WASHINGTON (CNN) - In the wake of Arlen Specter's defection to the Democratic caucus, Republicans are primed for yet another round of soul-searching and intra-party sniping about the GOP's future. That debate might be best illustrated in South Carolina, where the state's two Republican senators are sharply split on how the party should move forward. In one corner is Sen. Jim DeMint, perhaps the most conservative member of the upper chamber. In a speech to party activists last fall, DeMint became the first Republican to publicly blast John McCain after he lost the presidential election, accusing the Arizona senator of betraying core GOP principles in his quest for the White House. In the other corner is Sen. Lindsey Graham, a McCain ally and party maverick who has angered conservatives in his own state and party by working with Democrats on issues like immigration reform. Few Republican insiders in South Carolina would descibe DeMint and Graham as close. Appearing on CNN Tuesday, DeMint, a hero of the conservative grassroots, denied that his party has tilted too far to the right. "I don't think many Americans are going to agree that the Republican party has become too conservative," he said. "If you look at our record of spending, our record on every issue, the problem I think we have is Americans no longer believe that we believe what we say we do." DeMint says he isn't worried. He denied that the GOP has become a southern party, attributing Republican losses in the northeast to some northern voters who have left the region and moved south hoping to avoid labor unions and "forced unionization." He said Americans will eventually come back into the Republican fold because of growing alarm about the size of government and President Obama's fiscal policies. "I think you'll see this next election to be totally different," DeMint predicted. "Pat Toomey, who is running in Pennsylvania, is one of the most maintream Americans I know." But Graham said that politicians like Toomey - the former Club for Growth president who was leading Specter in Pennsylvania's Republican Senate primary - are the exact reason the GOP is languishing in places like the Northeast. Although Graham said he agrees ideologically with the Club for Growth "most of the time," he said "the people that they run in primaries wind up losing the general election." "I've got no desire to help the Democratic party get stronger," Graham said on Fox News Tuesday. "I am a center right conservative Republican who believes that our party has to grow, not shrink." Graham rejected Republican activists who seek a kind of ideological purity in their candidates, opting instead to heed Ronald Reagan's guidance that someone who agrees with you 80 percent of the time is a friend, not an enemy. Graham noted that Specter helped Republicans usher Supreme Court Justices Roberts and Alito through the confirmation process in 2005. "I don't agree with Specter a lot, but I am a practical guy," Graham said. "We've got to grow this party ... We need to get people in the party that can carry a fiscally conservative agenca, a center-right agenda, and that means recruiting people that are different than me, quite frankly." This moron has been voting with the dumb-a-crats for years. The republicans have lost nothing. What...GOP losses in the north ca be blamed by mass migration to the south because of unions!!!...LOL!!! The republican party will be far better when it realizes its core values are not based on religion, they are based on conservative financial policy (balanced budgets, adherence to core capitalistic principles, small government). Unfortunately I worry that Ronald Reagan has forever destroyed this brand of conservatism. I think republican's need to stop saying "look at our record"
See what he did there? He made "Democrats" into "dumb-acrats"! It's clever tactics such as this which have allowed the GOP to be the solid party of the people that it is! Fan of Common Sense...go back to playing your X-Box that your daddy bought for you and listening to that fat whiny drug addict who likes his Viagra "Boy-Island" vacations (Rush "Blubberbutt" Limbaugh)...and leave politics to the intelligent people. mccain, graham, martinex and crist are all RINOS and should join their true party. DeMint suffers from that all-too-common conservative belief that if you just say it, it must be true. He's on crack if he believes what he says, and he'll also find himself in a smaller and smaller minority of Congress. Not to mention irrelevant. moved south hoping to avoid labor unions and "forced unionization." Welcome Senator! Any others want to join the right side, the Left? We'd love to have you! "Pat Toomey, who is running in Pennsylvania, is one of the most maintream Americans I know." Jim DeMint has lost tough with reality. There are two parties left with credibility, the liberal democrats, and the blue dog democrats. Spector joined the centrist blue dog democrats. There are no moderate republicans anymore. Spector doesn't have to change one vote to fit into the democratic party, because he is a centrist.